How, if Kafka were to step out of time? And what if he were to land in Ayodhya? He would just shrug his shoulders and laughing heartily say, “A joke, indeed! Of Borgesian proportion, ah!” That is what Kafka does in Zafar Anjum’s charming book Kafka in Ayodhya and Other Short Stories (Kitaab, 2016). In story after story it is either Kafka or his Kafkaesque view of life that gives the stories their twisted appeal. When he (Kafka) encounters the confused media asking him about the structure in Ayodhya, his reply is characteristically evasive, “Leave the structure as it is” he tells them and confounds the media further as he declares, “Incompletion is also a quality, a facet of nobility. At least, that is what I do with my works.” (p.21). Ingenious, indeed! Nothing in the scheme of things reaches finality and that is how tradition and innovation overlap, merge and get reconstituted. Soon one realizes that Zafar Anjum is not interested in any particular place –Ayodhya or Gaza or Singapore; he is directing his shafts at the general condition of existence, the absurdity of it all: the manifold facets of contemporary life, the hilarious, the meaningless, the irritating and yet the plausible and logical. The prolific and multifaceted Zafar Anjum has given his readers a very slim book — not even hundred pages — of eight short stories while covering a vast territory. I don’t mean strictly in a physical sense. The reader cannot fail to notice the stories’ emotional register. It is not just a matter of inducting characters into fiction from varied ethnic, national and linguistic backgrounds or setting stories in political flashpoints, it is also having to deal with our modern and post-modern sensibilities. The polarisation of his emotional preoccupation is evident when one story deals with the daily grind of a young, married office clerk while the one preceding it deals with authorial indignities, evident in more than one story. Although coloured by diverse incidents that occurr against equally diverse socio-cultural backdrops, the common thread that runs throughout Zafar Anjum’s fascinating short stories in Kafka in Ayodhya (Kitaab, Singapore; 2015) is the sheer vibrancy of life in its infinite verities and under trying circumstances. The dramatic personae may change from one country to another, from one culture to another; yet, life goes on unabated amidst chaos. It is the rich emotions, pathos and unshakable kinships that forms the contours of life throughout the world. That universal truth resonates throughout the short stories in the collection Kafka in Ayodhya. One of the poignant short stories in Anjum’s book which is truly a tribute to life and unshakable kinship that sustains it is ‘The Thousand –Yard Stare’. Apart from the moving story and the masterly portrayal of real life characters, the short story is full of vividly realised passages that symbolically represent not only the harsh ground reality in a war zone or rather conflict zone but also how that backdrop shapes the lives of the masses who are caught up in the power play. In this week’s column, I examine how Singapore-based writer Zafar Anjum has depicted socio-political reality through his collection of Short Stories titled Kafka in Ayodhya and other short stories (Kitaab, 2015). What is significant in his seemingly organic prose is his innate ability to symbolically represent the harsh realities in the socio-economic and cultural sphere through the eyes of the man in the street. The book comprises eight short stories namely Kafka in Ayodhya, The Lone Fighter, The Rats, Waiting for the Angels, E.D., The Revolt, The Thousand –Yard Stare and Ima. Zafar Arjum has woven myriad complexities into his skillfully crafted short stories so that they are almost natural in representations, often depicting life in diverse parts of the globe. 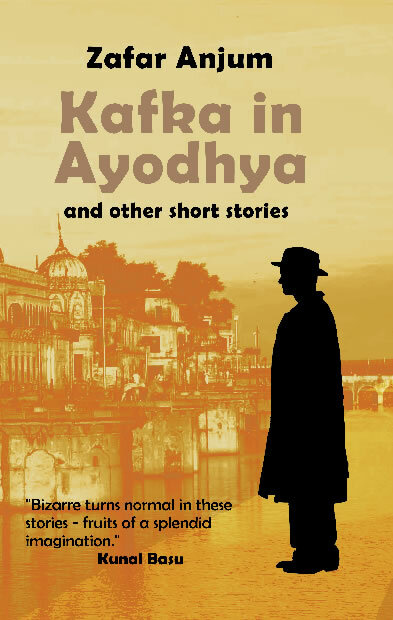 In the title storey Kafka in Ayodhya , the author masterly captures the complex ground realities as: “ When we got down to Ayodhya, a small ancient town with a Hindu mythological past, I was struck by its simplicity. It was a place that seemed to be content in its ordinariness, a featureless wasteland. Looking at its topography, the misalignment of structures, the smallness of its huts and buildings, the dirt and the dust, the idea of justice seemed asymmetrical to this place. The town seemed readymade to bear injustice and violence. “An ordinary man can enjoy breakfasting on juice and rye bread.